Home prices rose 6.8 percent year-over-year in the month of December, pushing the median home sale price up to $287,000, according to Redfin’s December housing market report. 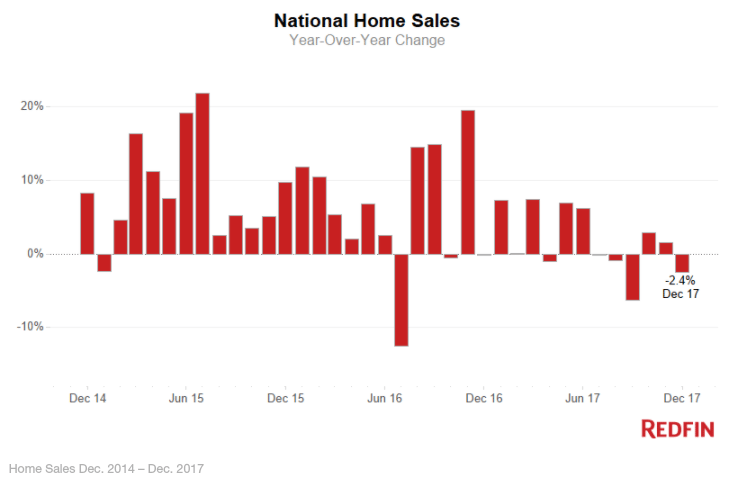 Home sales for the month were down 2.8 percent, and the level of available for-sale inventory plummeted 14.5 percent year-over-year, making December the 27th month of consecutive declines. Furthermore, the number of homes newly listed for sale in December decreased 3.0 percent, representing only 2.6 months of supply (rather than the typical six month’s worth). When looking at the year as a whole, home sales increased 1.7 percent over 2016 and prices rose 7.0 percent to a median sales price of $284,500. “Price growth will remain strong as many homeowners will remain deterred from selling due to the low mortgage rates they’ve locked in and the high price of their would-be move-up home,” she added. Much like Zillow’s December Real Estate Market Report, Redfin also revealed that San Jose, California, and Seattle had record-low levels of supply matched with record-high home price growth. San Jose and Seattle had 0.5 and 0.6 months of supply, respectively, meaning “that if the pace of home sales continued and no new homes were listed, it would only take about two weeks for all the homes currently for sale to find buyers,” said the report. But, the lack of supply didn’t halt buyer demand as evidenced by San Jose’s spot as the fastest and most competitive market with homes selling within 12 days, and most at above listing price (76.2 percent). Despite these factors, San Jose is still more affordable than its neighbor to the north — San Francisco. According to Redfin Estimate, the median value of off-market homes was $250,600, a 0.7 percent month-over-month increase. A little over 40 percent (42.9) of homes listed for sale in December were priced higher than their concurrent Redfin Estimate. San Jose, California, had the nation’s highest price growth for the third consecutive month, rising 31.9 percent year-over-year to $1,108,000. Meanwhile, Albany, New York, saw the largest decline (-3.2 percent year-over-year). Five out of 73 metros saw sales surge by double digits from last year, including Camden, New Jersey (+21.3 percent); Louisville, Kentucy (14.5 percent); and Orlando, Florida (14.2 percent). Cincinnati experienced the steepest decline in sales since last year (-20.8 percent), followed by Portland, Oregon, and Oxnard, California (-15.6 percent). Will 2018 be a buyer's market or a seller's market?